Same string display fields in different case? Now, i made a case structure for every choice of connection. My problem, i made the configurations for all five choices. So case one is OK. Now i like to put the configurations for the connection 2 in my 2nd case. but if i copy the configuration for connection 1 from case 1 in case 2 i'll get new fields and LED's (numbered with 6 e.g. string to write 6). But i don't want new fields, i like to use only my five strings for the individual connections. I like to use the same LED's in case 2 as in case 3 , only in case 3 should every string display field, LED etc. be added. :clock: I am still using LV7.0 & 6.1 - I can't open your vi. Do you mind saving it as 7.0? 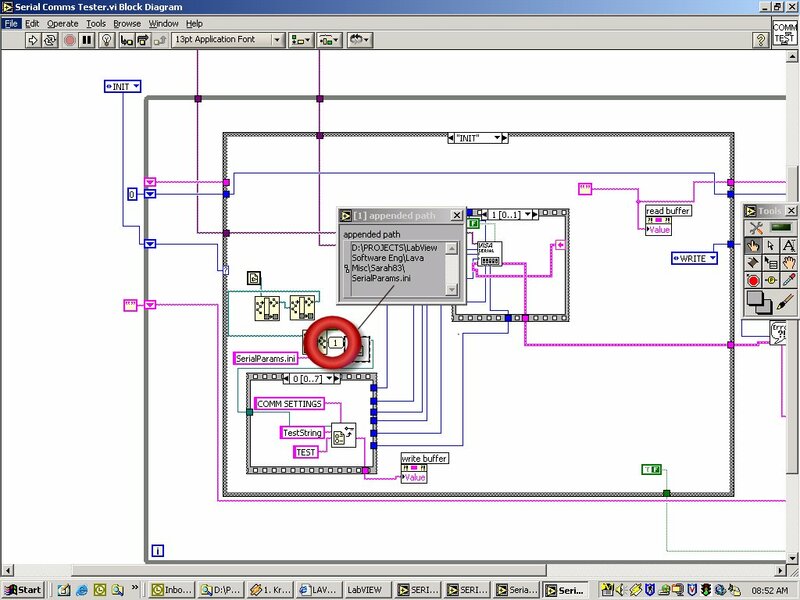 Click radio button on left "Save for Previous", then specify LabView Version 7.0 or 6.1. I opened the code in LV7.1 and re-saved it in 7.0 for the rest of you. As far as the code itself. I would recommend that you create 1 serial IO VI and reuse that. It will make your code easier to manage and read. Also, try to keep your diagram to a limited space like 1024x768 screen resolution. My desktop is 1680x1050 and I still couldn't fit everything on there. When I get a chance, I will try to submit a revision to your code but in the meantime, maybe others can make some suggestions. As related to your original question. I think if you create a few sub-vi's as I suggest, you will see that it will solve your problem. First what come upon Sara: suggest to use Tab Controls from Containers Palette. You will be able to hide repeated parts like Connection 1, 2 and others. I think if you create a few sub-vi's as I suggest, you will see that it will solve your problem. But I thought in a sub vi I can only put things that I needn't see permanent on the frontpanel. And I want to see my chosen connections (string to write, bytes written, VISA resource name, read string, bytes read...) and my "display area (visible display strings depends on the chosen connections from the radio button) " (the RX and TX display strings) permanent. Only the configuration should hide everytime until a user is clicking on the "config button". You could locate all configuration controls in one cluster and set Visible property for them depend state of "config button"
And if you use Tab Control, you can locate controls or indicators for each Connection at different tab and you still will have separate terminals on diagram (it is different to locate controls in cluster). Tab Control allow you set page with Connection you selected by connecting numeric value to Tab Control terminal at the diagram. From what I interpreted from your code, you are trying to make a serial comms tester. 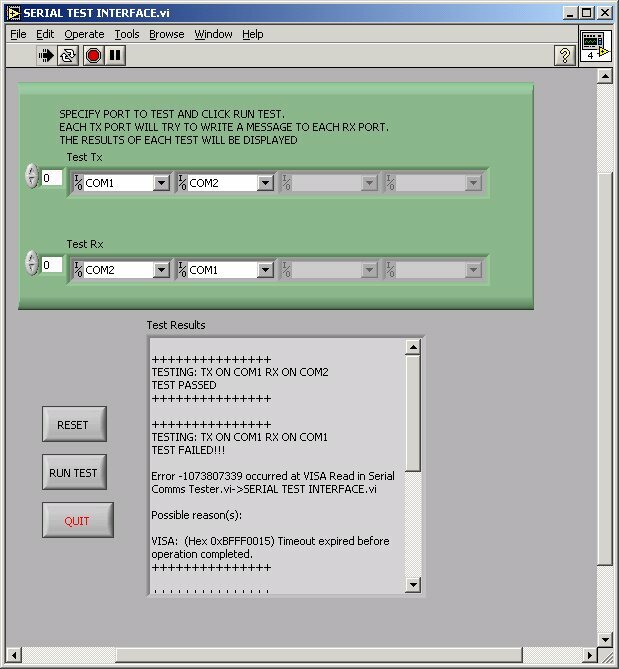 You want the ability to test the transmission (TX) from one comm port to a series of receiving (RX) comm ports. When you run the attached program, it waits for you to specify which comm ports are to be tested in TX, and which comm ports will be tested in RX. Each TX port will try to write to each RX port (i.e. if you specify COMM1 in the TX array, COMM1 and COMM2 in the RX array, then the program will try to write from COMM1 to COMM1 and from COMM1 to COMM2. The results of each test are displayed (see attached .jpg file for screen shot). The actual COMM tests are done using the same sub routine. This subroutine takes the serial settings from an .ini file (ex baud etc). If this were an application that I were using, I would go further to move all parametric data to a MySQL database and get rid of the .ini text file. Further, I would add routines to pull "test recipes" from the same MySQL DB - The UI would have a drop down showing the available test recipes, and the user would either select the desired test, or the program would sequence through them. Finally, the test results would be stored back to the DB. Make sure that the ini file is in the same directory as the .llb. But this .vi don't work, the problem must be at "read key (u32).vi ..
hmmm... I am not sure why it doesn't work. Make sure the ini file is saved as SerialParams.ini and not SerialParams.ini.txt and that it is in the same directory as the llb. Okay. The problem is with your ini file - it can't find it or open it. Probe the input to the open config data vi (see attached image). Make sure your ini file has the same path and file name as shown in the probed results.